Bone marrow cancer. 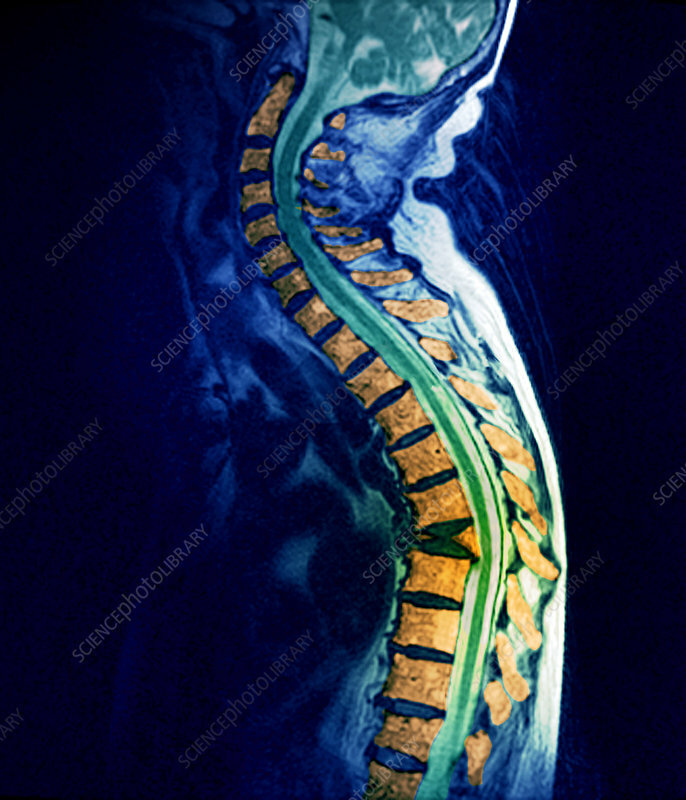 Coloured magnetic resonance imaging (MRI) scan of the spine of a 72 year old patient with myeloma (bone marrow cancer). The front of the body is at left. The cancer has caused one of the vertebrae (orange), the blocks of bone that make up the spine, to collapse (6th from bottom). The bone will be putting pressure on the spinal cord, which is very painful and can cause paralysis. Myeloma is a rare cancer. As it develops it can cause the bone to weaken and fracture. The cancerous cells also replace normal healthy blood cells, causing anaemia and a weakening of the immune system. Treatment is with chemotherapy and radiotherapy. In severe cases surgical repair of the spine is also needed.